It would be hard to find two people more physically different than PeeWee Herman and Kyle Kolb. I am pretty sure Kyle can bench press two PeeWee Hermans. It's an odd juxtaposition, but just the type of stuff you see in Las Vegas on the Strip. Kyle was out there for a family wedding, when he ran into "Herman." I am a bit jealous. I am always jealous when someone else is in Las Vegas, but meeting PeeWee is also cool. I am a bog fan of PeeWee. I loved his "Big Adventure" and his "Playhouse." I have been there many times and have never come across the Master of PeeWee's Playhouse. I guess that just means I have to keep trying, which means I have to keep going back to Las Vegas until I accomplish this goal. I am pretty sure I can persuade my brother-in-law Scott to join me on a Las Vegas excursion. Maybe 2015 will be the year I meet PeeWee. 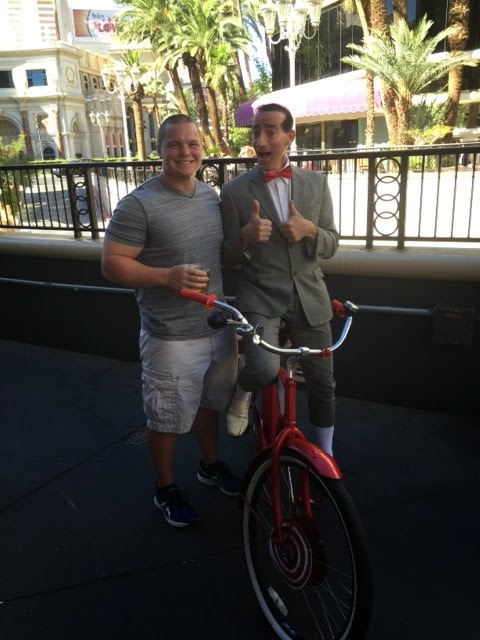 Kyle Kolb and "PeeWee Herman" in Las Vegas, NV-October 2014. There is always someone new to meet in Vegas. We will have to plan a trip for 2015! and MWibiaWhat happens in Vegas...stays in Vegas!! P.S. Kyle has some pretty big GUNZ there!